“Mrs. Bennet, who was also entitled to her prince charming” – really? There is a love affair for Mrs Bennet? I love what you are saying about this book, Rita. I definitely want to read it. Good luck in the giveaway Sophia! It sounds like a lovely variation. I’m looking forward to reading it. A prince charming for Mrs. Bennett! Things just keep getting more and more interesting! What a lovely review. I am eagerly anticipating reading this book. I have loved each of Jennifer Joy’s previous books. I must admit to loving your review of this book. I’ve never read one which stated how touched the author was by the beautifully carted words chosen to portray the hidden messages exchanged between Darcy and Elizabeth. I’m intrigued and am so looking forward to reading this story. Something tells me it’s going to very special. What a beautiful review. I am very intrigued with the premise and can’t wait to find out who Mrs. Bennet’s Prince Charming is! I love Ms Joy’s ability to weave a different twist into her stories. Thank you! Wonderful review. I am definitely interested in this variation. Beautiful review! My favourite line? 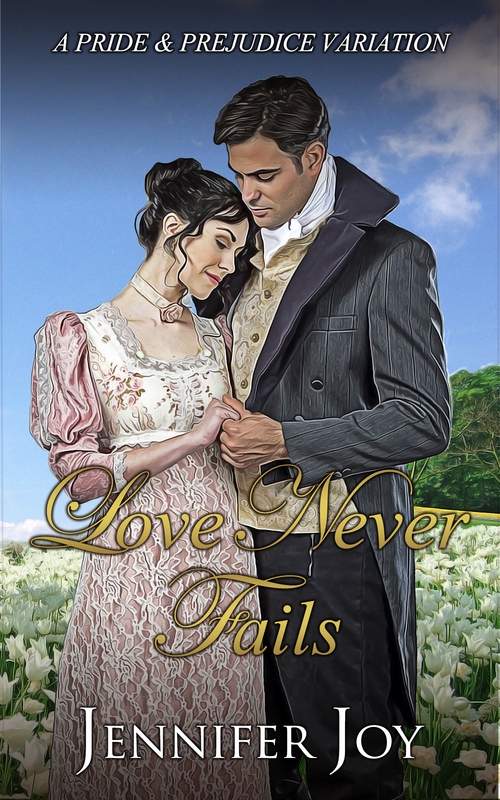 “Love Never Fails is a story of hope in a better future, of believing that love is worth waiting for and that it will come, sooner or later.” So true!! I can’t wait to read this book! It is very good Sónia, I think you would loooove this author. You have to read her books 🙂 Good luck in the giveaway! This is already on my Wish List. I have enjoyed Jennifer’s other books and this review makes for an intriguing tease. Keeping my fingers crossed. I am sure I will enjoy it. Thank you Sheila! For me, this is one of Jennifer Joy’s best books. I hope you like it when you read it, and will look forward to read your opinion 🙂 Good luck in the giveaway! Please don’t enter me in the giveaway, just wanted to pop by to say that I loved your review, Rita and can’t wait to read the book. I just won it and it looks like I won a gem! Thanks for writing such a gorgeous story, Jennifer Joy! I have Jennifer’s other novels but not this one. Rita, great review. Looking forward to reading this one a well! Great review! Besides all the wonderful aspects to the story, you had my wondering about who is Mrs. Bennet’s Prince Charming? The possibility of Mrs. Bennet allowing Elizabeth to marry who she actually wants is something I can’t wait to see play out. Interesting review. You made a couple of comments that stirred my curiosity and made me want to see how they play out in this book. Nice review, and I think I will love the book as well.